Debra Caplan tells the story of the Vilna Troupe, a "motley group of teenaged amateur performers, Jewish war refugees, and out-of-work Russian actors of Jewish descent" who went on to revolutionize the theater world. In this installment of her regular column, Asya Vaisman Schulman considers the role of gefilte fish in Jewish cuisine—and the "gefllte fish line" that divides connoisseurs. 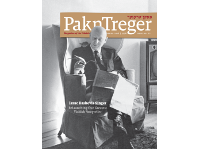 Become a member to receive the full print edition of Pakn Treger. Send letters to the editor to [email protected].